Whether you’re expecting a little one yourself and looking to stock up on quality eco-friendly layette pieces or if you have baby shower gifts to buy, our latest giveway will help! 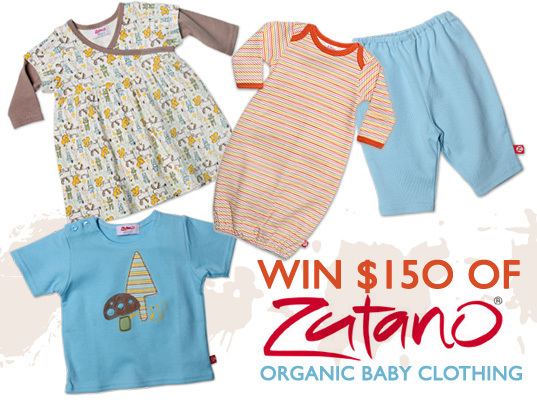 Zutano is giving away a $150 gift certificate so you can shop their new organic baby layette collection, which includes dresses, tees, leggings, pants, onesies, receiving gowns and blankets. You have one week left to enter. Follow the instructions after the jump for your chance to win this fab prize. Whether you're expecting a little one yourself and looking to stock up on quality eco-friendly layette pieces or if you have baby shower gifts to buy, our latest giveway will help! Zutano is giving away a $150 gift certificate so you can shop their new organic baby layette collection, which includes dresses, tees, leggings, pants, onesies, receiving gowns and blankets. You have one week left to enter. Follow the instructions after the jump for your chance to win this fab prize.